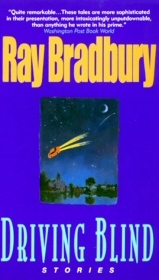 Ray Bradbury is best known for his science fiction works. In that field, he is one of the Old Masters, mentioned in one breath with Clarke, Asimov, and their like. However, Bradbury’s science fiction always had a very special touch to it. His stories were indeed classified as SF, but they touched people who never cared that genre. Bradbury’s work, especially The Martian Chronicles (reviewed here), put the fiction back into science fiction. His stories have a very special human touch, and his prose if of the highest quality. While Bradbury keeps on writing short stories, lately he focuses more on fiction in general. Driving Blind is a collection of twenty one such stories. Naturally, the stories in the book range in quality; some of them I liked much more than others. Some of the stories are plain and uninspiring, while others are true gems that have that special Bradbury spark in them. It is difficult to review such a book as a whole unit, since the stories are unrelated, and they do not add up to a coherent whole. Thus I'll try to briefly describe my feelings about some of the stories included. The story presented first, “Night Train to Babylon”, is rather opaque. From the “Brief Afterword” at the end of the book we learn that, in fact, it is somehow related to the author’s real life. I think, however, that most readers will not find it too inspiring. Likewise, several other stories, such as “House Divided”, seem pretty dull. Some of the stories are downright weird. “Fee Fie Foe Fum” shows that sometimes, the strangest things turn out to be true, and the garbage disposal unit really is your enemy. Though it’s not really a horror story, this is in fact a story in the best tradition of Stephen King. “Hello, I Must Be Going” and “Nothing Changes” are strange (and fascinating) enough to qualify for that category, too. But it is not these stories that make the book worth reading. The real pearls, the stories that re-create Bradbury’s very special magic, are stories like “Madame et Monsieur Shill”, or the story “Grand Theft”, where love letters are stolen from the house of an old lady and her sister. The letters, originally written over half a century ago by a lover now long forgotten, mysteriously re-appear, one by one, in their mailbox. And the sisters, fearing blackmail, have no idea what is really going on. Day after day the letters arrived, not by mail, but slipped in the box at midnight or dawn to be read aloud by Rose or Emily who took turns wiping their eyes. Day after day the writer from a far year begged Emily’s pardon, worried on her future, and signed himself with flourish and an almost audible sigh, William Rose Fielding. Other magical stories include “The Mirror” and my personal favorite, “I Wonder What’s Become of Sally”. How would you really like, asks this story, to meet all the people from your class, a decade or two after graduation? Bradbury’s dealings with people’s past, his unique ideas and his special writing style, create a very strong feeling of nostalgia. Some of the stories represent silly scenes from everyday life in a whole new light. “Remember Me?” speculates on meeting one’s butcher while on vacation, nine thousand miles from home. “The Highest Branch on the Tree” is another example. And of course, Bradbury still remembers the genre in which he started. “Mr. Pale”, the one but last story, is a science fiction piece that shows what the author is still capable of. Like the stories in his classical SF collections, “Mr. Pale” is naive, very soft-core, and yet presents the reader with a deep, penetrating question.